Kirsty Lingstadt is Head of Digital Library at the University of Edinburgh. She plays a key role in delivering digital services within the library, with a key focus on Discovery of Collections online. This article was published online by Liber, The Association of European Research Libraries, on March 8, 2018. LIBER’s Digital Humanities & Digital Cultural Heritage Working Group is gathering literature for libraries with an interest in digital humanities. Four teams, each with a specific focus, have assembled a list of must-read papers, articles and reports. 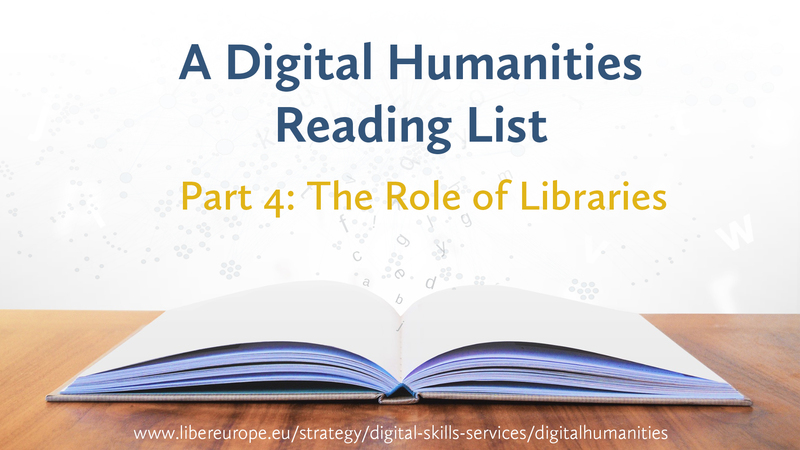 The recommendations in this article (the fourth and last in the series) have been assembled by the team looking at the roles of libraries in digital humanities and awareness raising in academic libraries. The team is led by Kirsty Lingstadt of the University of Edinburgh and, for these recommendations, Sarah Ames of the University of Edinburgh has lent additional support. This theme examines a challenging question: what is the role of libraries in digital humanities? Is it to provide advice and guidance, to provide services that support these activities or to be a fully-fledged partner in digital humanities activities? The answer is as varied as the different types of research libraries, and the literature highlights some of these tensions. It is clear, however, that libraries have a key place within digital humanities because of the collections which they hold. These collections often form the starting point of digital humanities projects and — when it comes to the outputs — libraries have a role in publishing, preserving and making these accessible. In particular, libraries hold detailed knowledge about audiences and their different needs. As articulated in Melissa Terras’ forthcoming article, usability and reuse are often not considered by digital humanities projects. These factors are, however, critical if the outputs are to have value for wider audiences. The librarian can offer unique insight and partnership to ensure that DH projects have a life beyond the project and add value to the collections held by the library. We hope that this list, in combination with the previous lists, will help provide some thoughts on the path which we should boldly follow. Digital Humanities In the Library/Of the Library. Caitlin Christian-Lamb, Sarah Potvin and Thomas Padilla. This special issue of dh+lib contains a number of case studies of libraries working in digital humanities areas, often leading to a reassessment of the role of the library, the services it provides and the skills of the librarian. The Role of Research Libraries in the creation, archiving, curation, and preservation of tools for the Digital Humanities. Christina Kamposiori. The recent RLUK report examines the role of research libraries in digital scholarship, through survey responses from RLUK member libraries. The report demonstrates the ways in which libraries engage in digital humanities projects and how and what support they provide, as well as examining the changing role of librarians and the skillsets needed to actively contribute to this area. RLUK advocate knowledge exchange between institutions on how best to engage and work with researchers, despite the issue that there is no single solution for all. Developing Digital Scholarship: Emerging practices in academic libraries. Alison Mackenzie and Lindsey Martin. This publication contains a number of different approaches and case studies of how librarians are working with digital humanities. The text looks not just at what new technologies support research and development in this area but also at the partnerships that libraries can develop. Supporting Digital Scholarship. SPEC Kit 350. Rikk Mulligan. The SPEC Kits 350 surveys a number of American institutions about their digital scholarship provisions, and looks to specific examples of services provided by libraries, as well as projects they support. Digital humanities in the library isn’t a service. Trevor Muñoz. This article is a reponse from Muñoz to a blog post from Miriam Posner, in which she writes about the challenges of ‘doing digital humanities’ in libraries. In his reply, Muñoz argues the case that research lead by librarians should be the central focus of digital humanities work in libraries. By focusing on service provision, rather encouraging librarians to lead their own experimental projects, we miss engagement opportunities and detract from the intellectual labour of library work in this area: ‘Framing digital humanities in libraries as a service to be provided and consequently centering the focus of the discussion on faculty members or others outside the library seem likely to stall rather than foster libraries engagement with digital humanities.’ Muñoz explains that this does not mean that library projects, tools or research may not grow into or improve services – but that these should stem from ideas, activities and partnerships formed within the library. No Half Measures: Overcoming Common Challenges to Doing Digital Humanities in the Library. Miriam Posner. Posner details the barriers to digital humanities work in the library, from lack of support and time, to the need for new skills and new relationships with academics, as well as proposing solutions. To successfully engage users with digital humanities in the library, libraries must ‘do a great deal more than add “digital scholarship” to an individual librarian’s long string of subject specialties’ (51), and instead look to space, culture (are librarians allowed to experiment? Do they have the support to do this? ), technology and training for their staff. Evolving in Common: Creating Mutually Supportive Relationships Between Libraries and the Digital Humanities. Micah Vandegrift and Stewart Varner. This article suggests ways in which libraries can engage with digital humanities research, from practical advice for establishing partnerships and engaging with the research community, to keeping up-to-date with new developments in the field. Vandegrift and Varner propose that the role of the librarian should be adapted and reframed – from ‘servitude’ to collaborator – to ‘support the journey of research as a means in itself’ (73) and embed digital humanities successfully in the library. Laying the Foundation: Digital Humanities in Academic Libraries. John White and Heather Gilbert. White’s Preface states that this text is intended to be a ‘conversation starter among rank-and-file librarians about how and why librarians, archivists, and museum professionals should engage with digital humanists as full partners in both research and teaching’ (xii). The chapters that follow emphasise the scale of the role that libraries can and should play in digital scholarship research, and the ways in which skills and roles need to adapt to accommodate this. To find out more about LIBER’s work in this area, see the Digital Humanities & Digital Cultural Heritage Working Group page. Greta Franzini, Melissa Terras et Simon Mahony. Forthcoming 2018. Expectations of Digital Editions of Text: Surveying User Requirements in the Digital Humanities. ACM J. Comput. Cult. Herit. (Accepted 2018, In Press). Head of Digital Library and Deputy Director of Library and University Collections, University of Edinburgh. Kirsty is passionate about Collections of all types - library, archive or museums - and engaging users with them. She believes that discoverability is key for online collections. She leads on discovery, digitisation, digital preservation and tools to support Digital Scholarship work within the University of Edinburgh.